The Governor also warned his supporters not to tear or deface the campaign posters of the opposition parties in the state. According to The Sun Newspaper, the Governor warned that doing so might lead to unnecessary rivalry and possibly breaking down of law and order which his administration has worked very hard to achieve in more than three years it came on board. Umahi gave the warning in Ishielu Local Government Area of the state while addressing a crowd of his supporters during a campaign rally held in the premises of the council headquarters. The donation, Umahi said, was to enable him and his running mate in the March 2 governorship election to change his posters and billboards across the state with good ones. 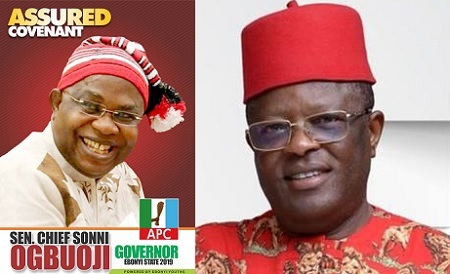 Umahi, who subsequently ordered his Chief of Staff, Offor Okorie, to release the money immediately to the APC guber candidate, said he was constrained to make the donation because the campaign posters of the APC governorship hopeful and his running mate were not good looking. “I want to donate N5 million to assist them to change their pictures. For the sake of the image of Ebonyi State, let them change those posters and billboards. People will think that is how Ebonyi people look like. I want the Chief of Staff to release the money immediately to them,” Umahi said. Umahi, however, said that he was happy that his administration was able to restore peace in the war-torn Ezza/Ezzilo communities, an inter-communal war which claimed several lives and properties. “To the extent that the NYSC, not only that they have returned, but they are ‘Atikulated’; to the extent that we are building new schools; we are renovating the Ezillo Water Scheme. There is no alternative to peace,” he added.